She’d raised them from peeps, and Ethel loved them all dearly. They gave her eggs and entertainment, but one of them had to go. 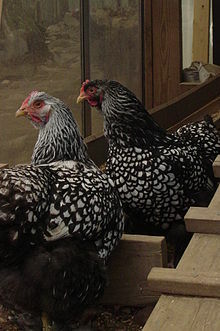 Marge, the only one of the chickens with an unpleasant disposition, had started attacking other birds and breaking eggs. Every attempt to break the habit had failed and there wasn’t enough space on her small property for Ethel to make another coop and run just for the one bird. If Ethel had been like most of the other people she knew, she’d have just made poor Marge into a soup, but it wasn’t right. Eggs were one thing, but killing a living creature was just beyond her. She wasn’t going to quit vegetarianism and murder one of her chickens just because it had a bad attitude. Still, that didn’t leave her many options. She’d called everyone she knew trying to find someone who wanted Marge, even going so far as to put out an advertizement in the local paper. She’d had a few people call back, but they would either balk when she mentioned Marge couldn’t be put with other chickens or would make it clear that Marge would end up in a cook pot. Giving her to someone that would kill her was no better than killing Marge herself. Ethel walked out to the coop. Bess was still limping from her encounter yesterday with Marge. Several of the other girls were missing feathers here and there. She winced seeing that Sussy was holding her wing oddly. One more injury she would have to attend to. Poor Sussy. She slid into the run, closing the gate behind her and moved towards the coop. Inside, she could hear Marge making a series of soft hissing sounds. An agitated Kelsey was pacing just outside the coop, moving partway up the ramp like she wanted to go in before backing down again. No doubt Marge was keeping the others out and had just destroyed all the eggs again. It had to stop. The girls were all stressed terribly and with the damage they kept taking it was a matter of time before Marge did enough damage to one of them that she’d die. Ethel held the latch to the door for a moment. No one was going to take Marge. Marge wasn’t going to stop this. That would be a death on Ethel’s conscience just as surely as killing Marge would be. She was startled out of thought by a sudden snapping sound. One of the girls had broken a stick as she ran across it. Sighing, Ethel entered the coop. There was Marge, her feathers puffed and her wings half open as she hissed at the opening and ramp in. She walked over, cooing slightly in the way that soothed all of her chickens. Marge looked at her curiously, then stopped hissing. Marge wasn’t exactly friendly towards Ethel, but she wasn’t vicious either. Stooping down to pick the problem chicken up, Ethel was pleased Marge didn’t struggle this time. Her hand instinctively stroked her back in the manner she did with all her chickens. There was the sound of another sudden snap.